On Sunday Italians will vote in the local elections, a race that is shaping up to have quite a relevant weight on the national level. The main yardsticks for assessing the vitality of Silvio Berlusconi's center-right coalition are the cities of Turin, Naples, Bologna and above all the country's financial capital, Milan. In the shadow of the Duomo the fight between the incumbent Mayor Letizia Moratti and his main opponent, Giuliano Pisapia, took a bitter turn last night. 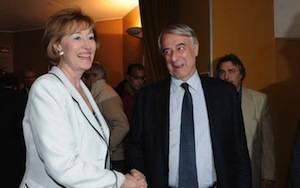 During a televised political debate, Mrs. Moratti, who belongs to Mr. Berlusconi's People of Freedom party, referenced an old Sentence of the Court of Assizes (an Italian court that has jurisdiction over serious crimes, including murder and terrorism) that held the center-left candidate Pisapia "responsible for the theft of a van to be used to kidnap and beat up a young man." In an attempt to underscore the political difference “between her and her main political opponent" for the upcoming local elections, Moratti insisted: "the story of a person who in those years was close to terrorist circles cannot be considered as unimportant.” Indeed Giuliano Pisapia, 62, a lawyer with a militant communist past, was once on the records for the attempted kidnapping of William Sisti (belonging to a competing left-wing movement, Movimento Lavoratori per il Socialismo) and the theft of a van. However, the senetnce was later cancelled as a case of miscarriage of justice and, in 1985, Mr. Pisapia was fully acquitted by a higher court. He was not given the opportunity to publically reply after Moratti’s statements and will thus sue her for slander. Soon afterwards, several people expressed support for the center-left candidate, including representatives of the right-wing majority. Prime Minister Silvio Berlusconi, on the other side, praised Letizia Moratti's TV interview saying, "I do not see how the Left can be upset just because Moratti mentioned a case in which a candidate was found guilty of a crime." 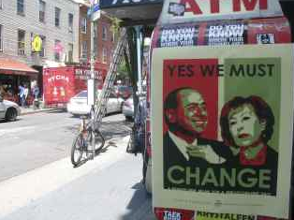 Meanwhile, this morning New Yorkers woke up to posters of Moratti and Berlusconi plastered all over Brooklyn and Manhattan. 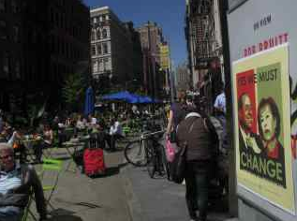 The pictures of the two were accompanied by a caption, which playing on the famous Obama slogan “Yes, we can,” read “Yes, we must change.” Behind the posters is Dario Parazzoli, an Italia dei Valori candidate to the Milan City Council, who, with the help of some Italian Students in the US, has brought his media campaign to this side of the Ocean. Waiting to see what will happen on Sunday at the polls in Milan, this all-Italian story that reaches beyond the Atlantic and spans to New York deserves to be put on record.